The Catholic Church of the Most Holy Mother of God stands on a steep hill overlooking Golden Horn Bay and its port with many ships. Here the Russian sailors landed in 1860 and set up a military post called Vladivostok. The story of the church is as dramatic as the fate of the people who built it in this end of the world. The majority of these people were Poles who found themselves, against their will, in this remote province of the Russian Empire. At first, Catholics did not have their own place of worship and celebrated Holy Mass at the home of a Protestant pastor. In 1900 the Polish Catholics built a wooden church with a small bell tower on a piece of land allotted to them by the city council. The church could barely accommodate all the parishioners because there were more than 3,000 faithful. The Polish parish had 1,500 infantry soldiers from a local military fortress, recruited forcibly in Poland; 500 marines; and 1,500 craftsmen and civilians. In 1902, the small wooden church burned down, and the parish established a special architectural committee with the Reverend Pastor Piotr Bulwicz as chairman. Engineer architect Alexander Gwozdziowski, provincial secretary Konstanty Rochalski and collegiate secretary Felicjan Wilczynski were the prominent members of the committee representing the Polish settlement in Vladivostok. 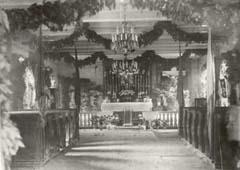 Interior of the temporary wooden church as it appeared in 1913. 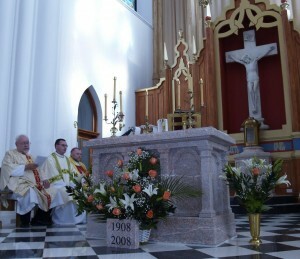 Note the marble crucifix to the right of the altar. The committee immediately started working on the project, gathering funds to erect a solid stone church. In the meantime, the parishioners worshiped in a temporary wooden church. Although this church was to be used for only a few years, the interior was nicely decorated and it housed a beautiful, white marble crucifix that was almost life-size. The first project designed by the architect Gwozdziowski was rejected as too costly. The committee then announced an open competition for the design. On June 22, 1908, the project by the architect Wlodzimierz De Planson was selected and approved. Jan Mancewicz, a local harbor administrator, donated an appropriate lot, and on June 12, 1909, Archbishop Jan Cieplak blessed the cornerstone during the ground-breaking ceremony. Following a very enthusiastic start, the construction encountered continuous difficulties due to lack of finances and the extremely unstable political situation. The building process took 13 years to complete. 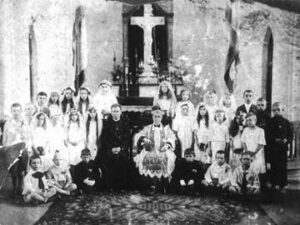 Finally, on October 2, 1921, the Vladivostok dean, Reverend Karol Sliwowski, consecrated the church. According to the design, the new stone church had three naves. The frontal elevation and the sides of the church were decorated with tall, arched windows, ornamental buttresses and sharp arches. The interior of the building was beautiful and could accommodate almost a thousand people. Snow-white columns with rich stucco works separated the naves. Mosaic panels decorated the walls with biblical themes along with pictures of Christ the Redeemer, Our Lady of Czestochowa, and Our Lady of Ostra Brama. The cathedral was furnished with chandeliers, pews, candle holders, a censer, ciboria, chalices, and other liturgical utensils. Interior of the new stone church, with the crucifix prominently displayed. This photograph was discovered in 2001 in the archives of the Ursuline nuns in Krakow, Poland. The most precious furnishing of all was the marble crucifix made by an unknown sculptor. The local historians attributed the work to the famous Russian sculptor Peter Klodt. There is no definite date as to when this crucifix became the property of the parish. In a 1912 financial statement of the parish, there is a note that Mrs. Zulewicz used her personal funds to build a strong base for the marble crucifix in the church. At that time, the stone church was still in the building process, so the crucifix was placed in a temporary house of worship. The photo donated by Zofia Brzezinska. Bishop Sliwowsky is seated next to an unknown priest. 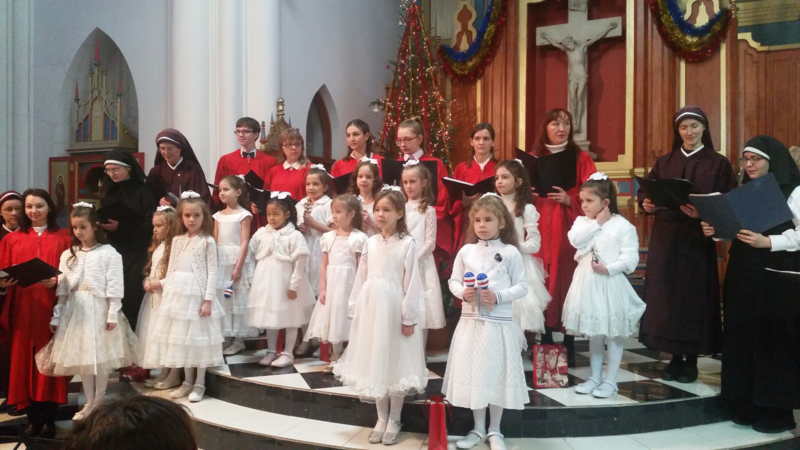 Zofia is the tall girl standing directly behind the bishop. On February 2, 1923, the Vatican administration created the Diocese of Vladivostok, with Karol Sliwowsky as bishop. Thus, the stone parish church became a cathedral. It was the last peaceful and pleasant moment in the life of the Catholic community in Vladivostok. In the Far East, as in all of Russia, the Soviets initiated an antireligious campaign. Priests were arrested, and most churches were closed, confiscated or utterly demolished. The small Catholic seminary in Vladivostok was closed, and all parish buildings became national property. Eventually, the sick and aging Bishop Sliwowski came to live in a small dwelling in a Vladivostok suburb under house arrest. Casimira Piotrowska cared for the ailing bishop. Meanwhile, Holy Masses were celebrated in the cathedral by the young Fr. Jerzy Jurkiewicz. Unfortunately, the number of parishioners diminished rapidly. Many Poles returned to their homeland, while many others emigrated to different countries. Afraid of repression, the remaining parishioners frequented the cathedral only sporadically. In 1931, Fr. Jurkiewicz was arrested, and soon afterwards, activity in the cathedral ceased entirely. In 1935, the Soviet authorities confiscated the cathedral and assigned the building to the Bureau of Archives. This assignment probably saved the cathedral and the marble crucifix from destruction. The cathedral was not very suitable to accommodate the archives. So a professor of architecture at the Technical University, Mikolaj Riabow, was summoned to redesign the interior of the building. He later recalled that during the visit to the archives, he noticed in the director’s office a unique marble crucifix and was amazed at the excellence of the workmanship. During the reconstruction, the altar was separated by a vertical wall, and four stories of rooms filled with shelving were built inside the church. It is unknown what became of all the cathedral furniture and artifacts. The large and very heavy marble crucifix was too difficult to move, however, and remained in the archives office for some time. According to some old archives employees, the crucifix traveled for dozens of years between several storehouses and finally landed in the Academy of Arts in Vladivostok. For about the next 50 years, the crucifix was housed at the Academy. In 1991, the administration of the school refused to acknowledge that the marble crucifix was once property of the Roman Catholic parish. Director Timofejew claimed that it had never been church property, but was dug out at a cemetery and brought to the school. At the time, we had no documentary evidence proving that the crucifix had been taken from the Church. Seeing an opportunity, though, the Academy administration then attempted to barter for the crucifix. Assuming that the American priests now serving the parish were wealthy, they offered the crucifix in exchange for five personal computers. Without even one personal computer to spare, the priests opted to wait and pray. Eventually, the first communion photograph came to light. The priests were then able to present the photograph which clearly showed the crucifix in the church. The Academy again protested that the evidence was insufficient, and followed with a new offer of barter. This time, they asked for 30 personal computers, all with color monitors. But the priests continued to wait and pray. Finally, in 1996, a parishioner thought to ask the Primorsky State Archive (which had previously been housed in our church) if they might have a record showing the transfer of the crucifix to the Academy. The archive director looked, and found a written act of transfer of the crucifix from the archive to the Academy as an object of a “methodical collection.” On the reverse of the document was the signature of the school director and confirmation of the receipt. When the document was presented to the state Directory of Cultural Affairs, the Academy was forced to turn the crucifix over to the Catholic parish. The marble crucifix at the back of the church. Parishioners filled the vases with flowers before the Sunday Mass. The return of the crucifix became a special holiday for all the faithful and took place on November 4, 1996. On that day, the marble crucifix was taken out of the School of Arts and placed on the grass lawn. Numerous parishioners surrounded the crucifix. Some of them remembered it from the time when, as little girls, they prayed in front of it in the cathedral. It took a crew of 14 men, all volunteers from the parish, to carry the crucifix out of the Academy to a waiting truck and then into the church. It was placed in a prominent position in the back of the church, as there was no suitable structure to support it at the altar. 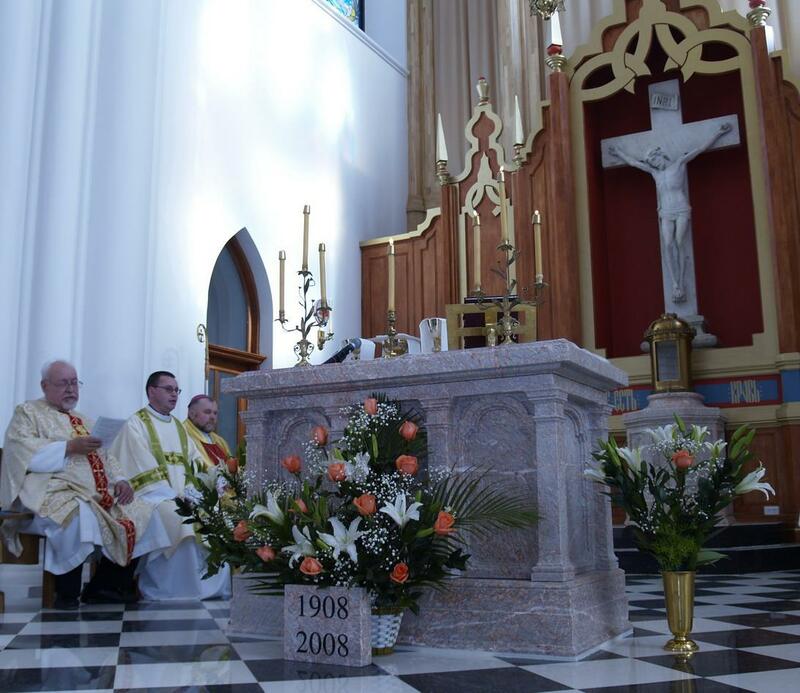 The crucifix had already been in place for nine months when the consecration occurred in 2008. 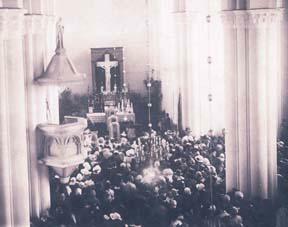 On May 14, 2007, the crucifix was finally returned to the spot it had occupied in 1922. Carpenters then began building the reredos around the sculpture. Church renovations continued for some time, but the crucifix remained in place. At last, the church was consecrated on February 2, 2008, with Bishop Kiril Klimovich, numerous priests and deacons, and many proud parishioners in attendance. Vladivostok Chronicle, Volume I, pages 54-55. Newspaper Far East, June 10, 1909.